Nexus One Reviewed | Android Blast! The Nexus One is out and guess who has got their hands on one already. Engadget has published a very extensive review of Google's "super phone." 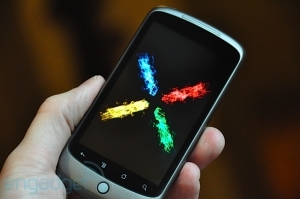 "The Nexus One. In the modern climate of hyped (and over-hyped) smartphone launches, Google's official entry into the phone-sales game has excelled in a department where many find difficulty: generating legitimate excitement. Of course, long before the name Nexus One or the recent bounty of pictures and details existed, the very concept of a "Google Phone" had been ingrained in the public conscience, predating even the Open Handset Alliance and Android itself; the company dabbled in the concept of direct sales through its offering of the Android Dev Phones 1 and 2 (alias Ion), but this time, it's a public retail ordeal, not a couple of one-off developer specials. The genuine-article Google Phone is finally here -- for better or worse."